A ‘dishonest, greedy’ and possibly bigamous school accountant has been jailed for nine years for stealing £4.1million of taxpayers’ money – and lavishing it on four women. 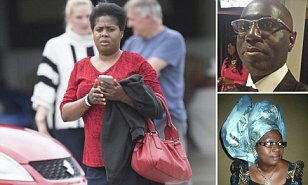 In Britain’s biggest ever education fraud, school accounts manager Sam Kayode, 59 – a part-time pastor – spent the cash on his real wife, a second ‘wife’ and two alleged mistresses. He bought luxury cars including a Mercedes, an Audi TT sports car and an Infiniti, and is also feared to have sent much of the money to his homeland of Nigeria. Despite overwhelming evidence, he tried to blame the theft on his late wife Grace and an office junior. He claimed they conspired to smear him by transferring the money to his joint account in revenge for his adultery. Kayode spent seven years looting the accounts of Haberdashers’ Aske’s state schools in south London, now an academy chain acclaimed by the Government. During those years no questions were asked about the secretive man who locked himself in his office to work late, after arriving in a Mercedes, wearing £500 Gucci shoes and carrying a Louis Vuitton briefcase. Last night Kayode, who was paid £57,000 a year, was behind bars after he was found guilty of obtaining £150,000 by theft and £3.95million by fraud. A nine-year jail sentence, near the maximum, was handed down at Woolwich Crown Court on Friday. Haberdasher’s has recovered only £800,000, and says there are no assets to retrieve from Nigeria – despite claims he had a property empire worth more than £1million there with ‘second wife’ Olubunmi Halima, 33. Prosecutor James Thacker said the father of four from Ilford, East London, was a ‘dishonest, greedy man’ too arrogant to admit his guilt even after he was caught red-handed in 2012. The accounts manager started work at Haberdashers’ – which has links with the public schools of the same name – in 1997. Mr Thacker said that in 2006 Kayode starting using the BACS money transfer system to put tens of thousands at a time directly into a joint account held with wife Grace. He then spent up to £98,000 a month. As well as spending money on his real wife Grace’s private health care – until her death aged 53, in 2013 – he also signed documents showing he was making investments with Miss Halima, and renting flats in Kent for ‘partners’ Toyin Lawal and Yetunde Turtak. Kayode said he had lied about marrying Miss Halima, and denied affairs with the other women. At her house in Northfleet, Kent, Miss Lawal, 50, said that when she was short of cash, Kayode paid one month’s rent for her in his role as pastor at a Nigerian church. She denied they were lovers.